It’s been 9 long months. Time to birth this baby! What, exactly, is the Soma Double Cross? 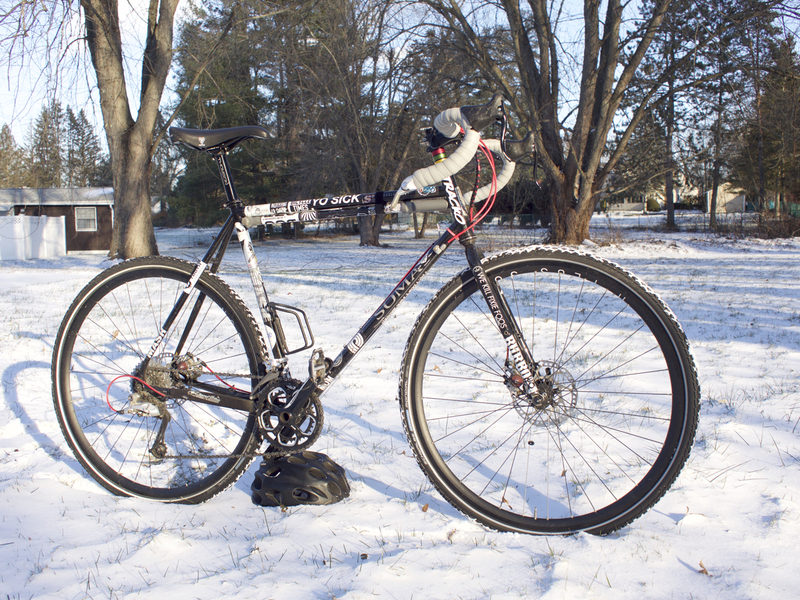 The Soma Double Cross Disc served as several different bikes for me. 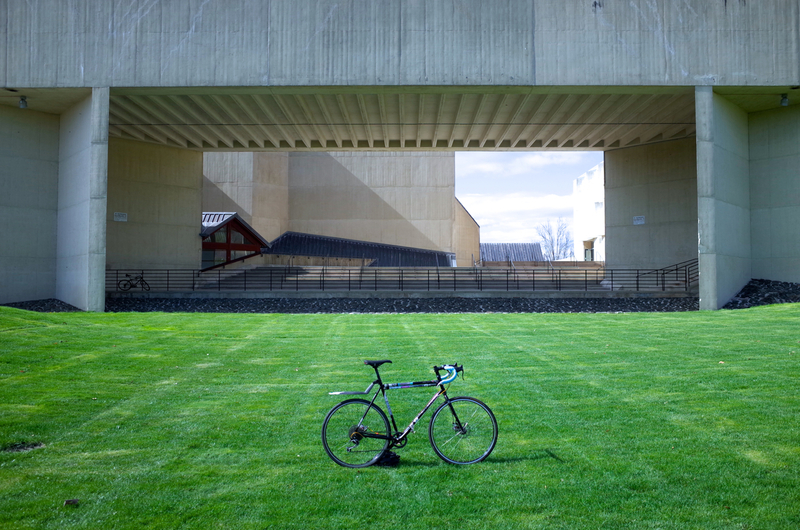 With a simple tire swap or a rack and panniers, the bike transforms itself. Or, rather, maybe it doesn’t. Over the last nine months, it didn’t seem to matter what I pointed the Double Cross at, it was ready for just about anything. So, without further ado, here’s my 9-month review. I got my Double Cross in early April of last year, as a bare frame. Soma was nice enough to give me a bit of a discount in exchange for my ongoing feedback and eventual review, but it wasn’t the type of situation where I was testing and returning. This was going to become my bike, the frame that replaced my primary bicycle, my go-to everyday ride. As soon as it came in, I stripped my old Raleigh and started transferring parts over to the Double Cross. It took about a week to get the new wheels in and get it all built. 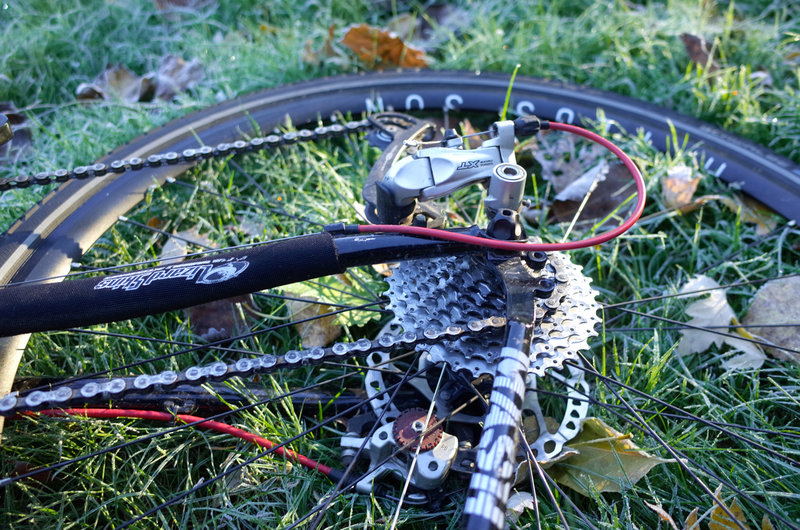 Note that my front fork is a Salsa Vaya fork, which has almost identical geometry (+/- a millimeter or three), so don’t take anything in this review as a reflection of the stock Soma Double Cross Disc fork, good or bad. I never used it. The first thing that jumps out is the lightness of the frame, which comes in at just 4.3lbs. My Double Cross, fully built with very un-light components, a steel fork, touring wheels, and alloy bars, stem, and seatpost still comes in under 25lbs. Building with race components and a carbon fork, I would hazard a guess that you’d only gain a pound or two over an equivalent aluminum frame if that, a modest trade-off for the ride quality synonymous with steel. A ~20 lb. build or lighter is definitely possible. It’s not just any steel, either. 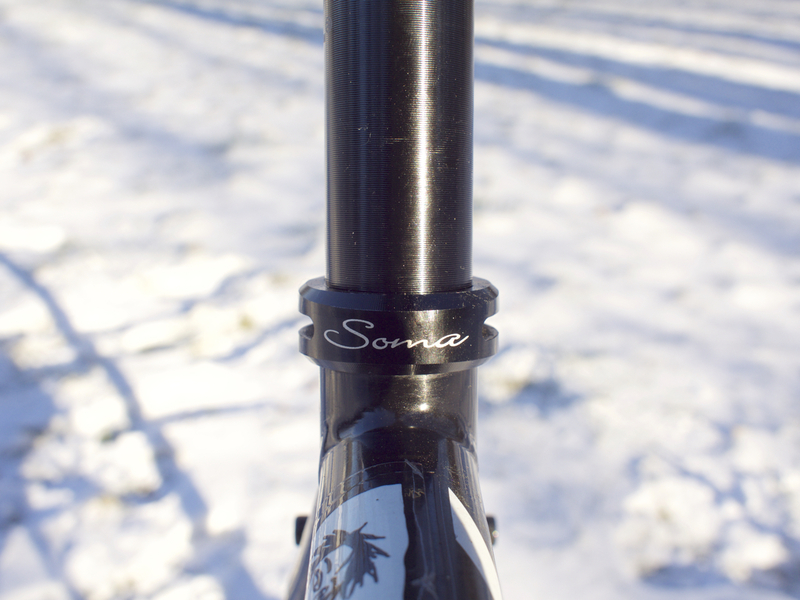 Soma uses Tange Prestige double-butted cromo, with variable diameters and thicknesses for each tube, chosen specifically for its role in the overall performance of the frame. 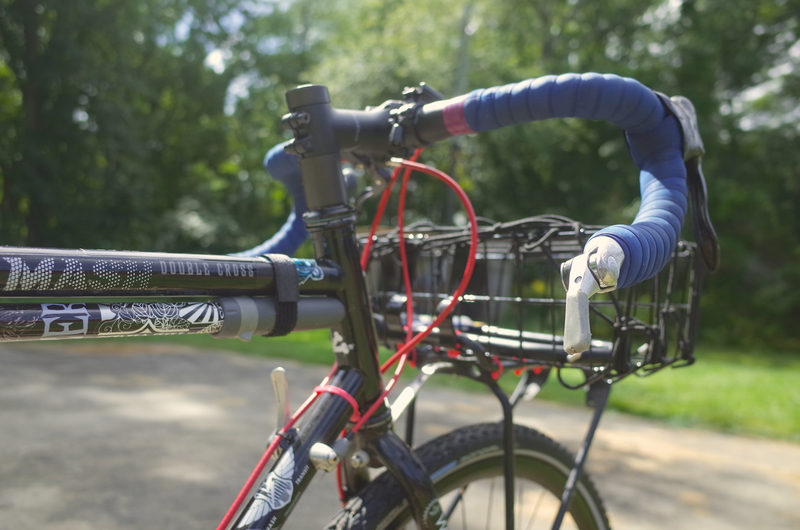 It speaks to a quality and tubing selection that you just don’t see very often, now that most “performance” bicycles are made from carbon and aluminum. The paint is nice, too; I didn’t need to face the head tube or bottom bracket shell before installation (although Soma recommends you do so before installing your headset and BB), and it has kept its gloss over the test period, where it pokes through the carpet of stickers. To put it a different way, not once was I riding and thought “Man, I shouldn’t have brought my ____ bike.” The Double Cross gets completely out of the way for a great ride with no excuses, no matter where you end up. Dirt, pavement, mud, you name it. I had the 28mm Gatorskins on most of the time, even though my terrain was always mixed. On more than one occasion, I found myself desperately chasing much more all-terrain bikes with tires twice as wide on the trails that cut through the woods in my town. Singletrack sometimes broke up into no track at all, but the Soma still rolled on. The frame has several key notes that made it easy to build up, easy to adapt to different tasks, and easy to upgrade and edit along the way. Tasteful mounts for racks make this touring-ready, though I wouldn’t load up beyond 30-40lbs. It’s a light tourer. Standard 1 1/8″ threadless head tube and English-threaded 68mm bottom bracket sizing means this bike is compatible with the lion’s share of component groups, from Shimano XT to Campagnolo. 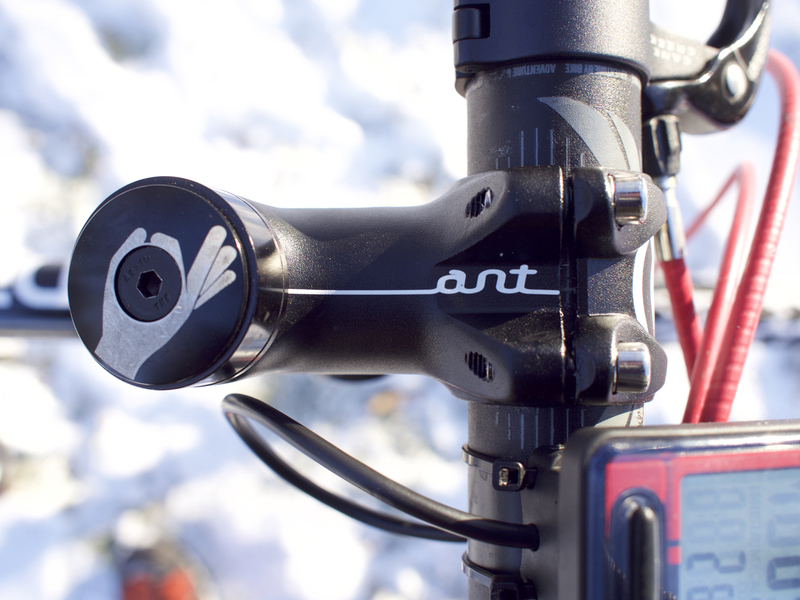 Downtube shifter mounts allow every possible combination of shifters to suit whomever. Not using them? You can install a pair of downtube caps with barrel adjusters for quick derailleur trimming instead. Full-length housing for both brakes. Definitely makes compressionless housing a must, but it’s worth it for wet weather. Perhaps the biggest nod to functionality in this frameset is the tire clearance. There’s a lot of clearance atypical of a CX bike, up to 41c in the back and “A Lot” in the front, although Soma’s Cazadero tires fit, too, and that’s a 42c. It’ll take a huge touring tire and fenders, if that’s your thing. The bike is ample. The Double Cross’ bigger cousin, the Wolverine, takes a slightly larger tire, and I would peg the Double Cross as the more confident road machine of the two. If your riding is a spectrum (and shouldn’t it be?) that tilts slightly more towards dirt roads and pavement than true singletrack, this should be your next bike. It doesn’t feel empty with 28mm tires, since the slender, narrow-spaced seat stays hold a pretty striking aesthetic no matter what tire you’re running. When you need the room, it’s there. Eventually I threw on touring tires, the Schwalbe Marathon Mondials, and enjoyed the security of being nearly flat-proof. 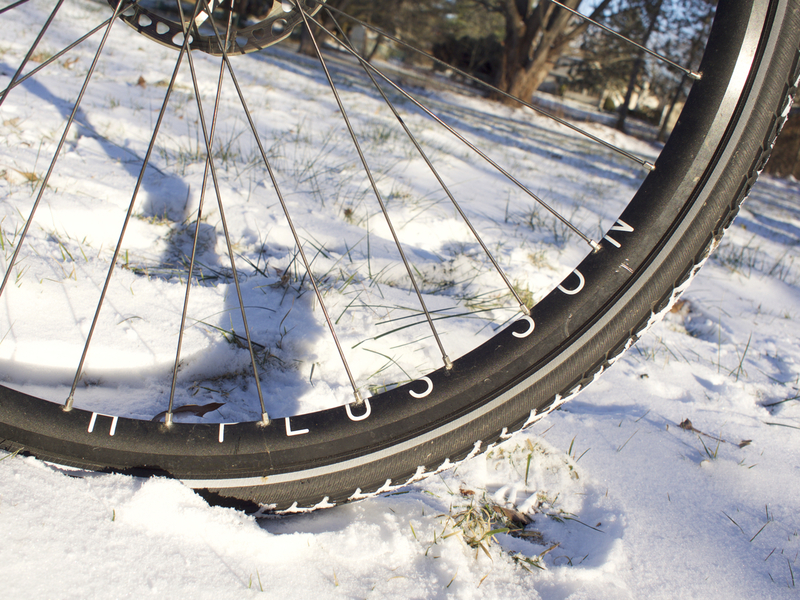 My next tire is going to be 40c, file tread, and tubeless. Yeehaw. I can’t afford a custom frame, and even if I could, I’m not sure you could convince me that there’s much to be gained over this frame. Because Soma selects the tubing diameters, butting, and thicknesses for each individual section of the frame (and changes the selection according to frame size), the bike feels like it’s custom-built. This bike is not made in the United States, but it’s not made in China. 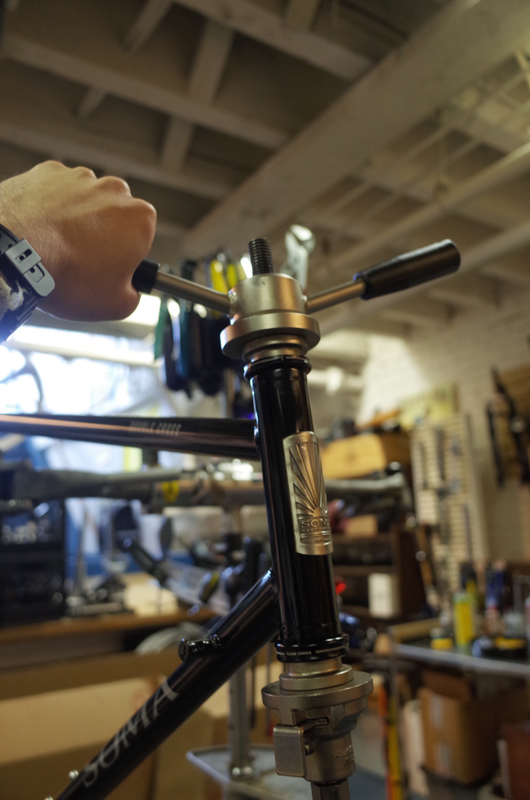 The framebuilders Soma uses are from Taiwan. They have a close relationship with a select group of framebuilders with years of experience producing hand-crafted, high-end steel frames. Importing is a harmful practice when product quality, human rights, and transparency are sacrificed, but an overseas moniker does not automatically imply any of these. I learned a bit about Soma’s relationship with their framebuilders at my LBS, and judging by the even consistency of the welds, I am confident that this frame is all a hand-built frame can be. The only difference between this and a custom jawn is the geometry, and Soma offers 11 (!!!) sizes for you to narrow it down, from 42mm to 62mm, plus a 66mm for Clydes and Athenas. Since the fit is pretty straightforward (no abnormally long top tubes, etc) it should be easy for just about anyone in the 99th percentile to get a great fit. Kudos to Soma for thinking about the outliers! For me, the 58cm was dead-perfect. It was a better fit than all three of my previous bikes. The reach is good enough that I can run a 60mm stem for gnarly offroading and a 120mm stem for faster road-riding, and both work just fine. 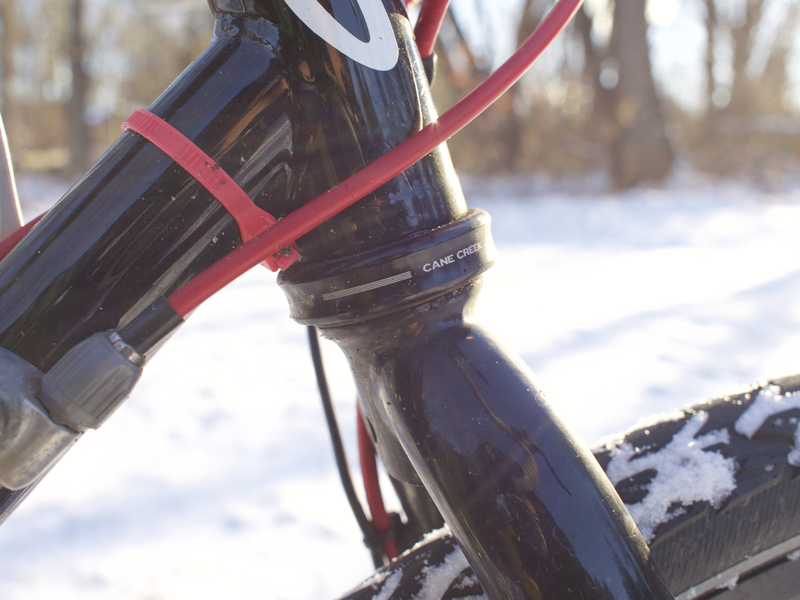 I have it shown here with a 60mm because I’m trying to stay a bit more upright in the snow, which is helped along by the taller-than-average head tube. Don’t let the pro peloton fool you; there’s nothing wrong with a slightly higher stack height. It keeps your lower back happy when your itinerary includes triple-digit distances. The disc brakes on this frame don’t feel like an afterthought, even though the geometry between this version and the cantilever version is identical. The mount is placed on the chainstay rather than the seatstay to allow full compliance with most racks, which is a nice touch that cements the “light touring” aspect of the Double Cross a little more firmly. I found the brake was a little challenging to adjust given how close that rear bolt is to the seatstay. It just barely works, but it works. This is where the Soma falls behind other steel frames, and maybe that’s okay. The steel offerings from most other companies tend to be way overbuilt for the type of riding this bike wants to do. Thicker tubes, struts, reinforcements, and larger diameters make for an indestructible bike, sure, but you lose ride quality, compliance, light weight, and smooth feel. The Soma makes some concessions to the durability gods, and I have one or two good dents to remind me, but it’s intentionally so. I would say, take care of your Soma, and it will take care of you. That said, the quality feel doesn’t end with the ride. The paint is very even, very rich, and very durable. I have very little scratching and pitting, even in high-wear areas like the bottom bracket. Everything is still shiny, which I don’t deserve after all the abuse I put this bike through. Similarly, that big nickel-sized dent I put in my top tube didn’t get any worse (i.e. the top tube didn’t fold in half! ), and the paint didn’t chip, flake, or crack. So what, exactly, is the Soma Double Cross Disc? 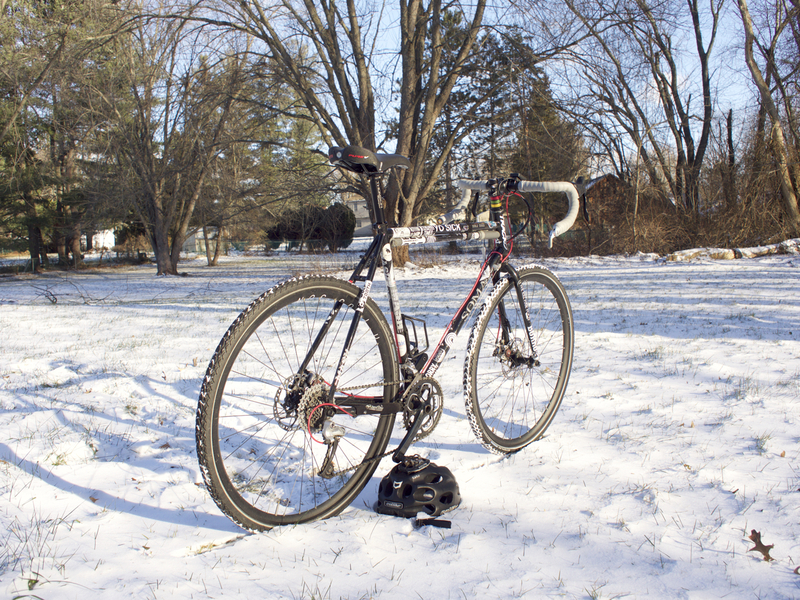 Yes, it’s definitely a cyclocross bike. It’s race-ready and performance-driven from bow to stern. Yes, it’s a road bike. All-Road, if you will. Other than breakneck high-speed downhill, it excels. It’s most suited to long distance and endurance riding, or as a training bike, or as a road bike for riders who can’t take the harshness of a traditional road frame like they used to for one reason or another. Yes, it’s a light touring bike. Light. Light. 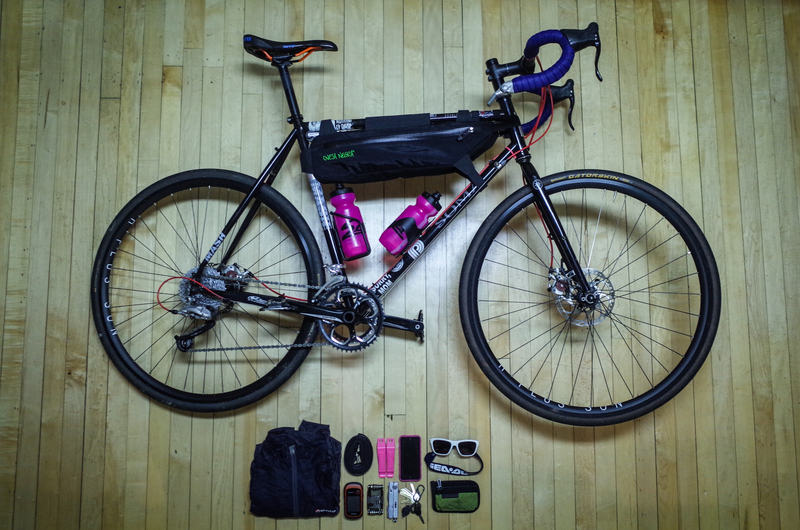 Don’t put four Ortliebs, a handlebar bag, and a rack-top duffel on. I mean, you probably could, but you’d get a little flex in the frame and you might not enjoy the ride as much. I used this bike with loads from 10-20lbs and loved it, and I would/could push a bit more. Check out any of my gear lists at the top of the page for loadouts that are more than Double Cross-friendly. This bike is all about compromise, and yet, it feels like it doesn’t make any compromises at all. A knife’s edge was walked between each specific use this frame was designed for, and somehow it manages to exist as a perfect venn diagram between almost every discipline of cycling. It doesn’t overcommit you to anything, and if you only used it as a road bike, CX bike, or touring bike for its entire life, I am confident it would perform its duty as good and likely better than any other purpose-built bike in any category currently on the market at this price point. Bottom line: to do better than the Soma Double Cross Disc, you’d better be ready to spend double or triple the value of this complete bike. It is an absolute steal, compared to the rest of the field. 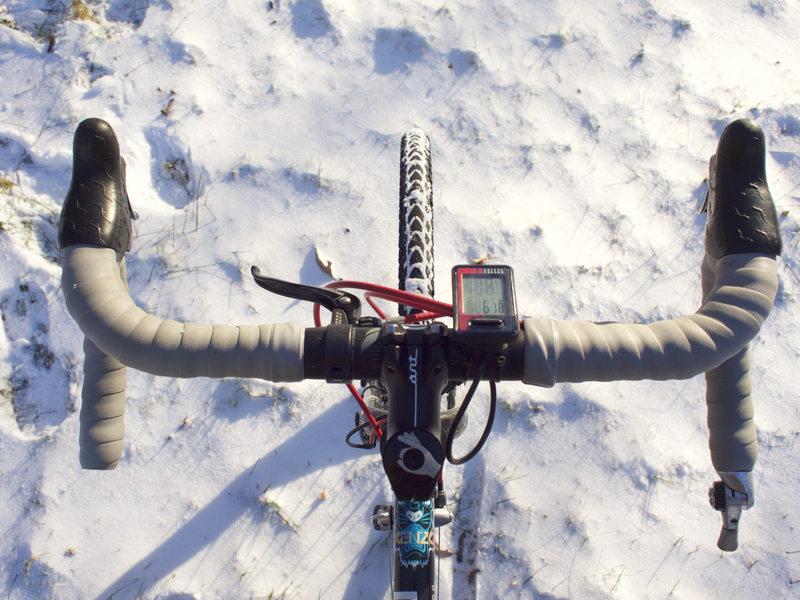 There’s a reason I replaced my mountain bike with a Soma, too, and I am super bummed they came out with the Sandworm a week after I got a fatbike. Bad Max, no! No bike lusting! Posted on January 14, 2016 November 28, 2016 by mdiltheyPosted in Photo JournalTagged cyclocross, Double Cross, Double Cross Disc, Light Touring, review, Soma, Soma Double Cross, Soma Double Cross Disc, Soma Double Cross Disc Review. Dude where did you find that rad sticker on your downtube that says Powell something? Hah, it’s one of the old Powell Peralta skull stickers. Pretty sick! I have a second one kicking around but I don’t want to sticker up the other bikes too much, for some reason… I don’t know why I like what I like, but I know what I like! What’s the decal that goes down below that with all the details and lines then? Mash SF! From their Parallax run a year ago. I want it! 🙂 Thanks Max! Just curious but why the double cross over the wolverine? I’m trying to make that decision myself atm. 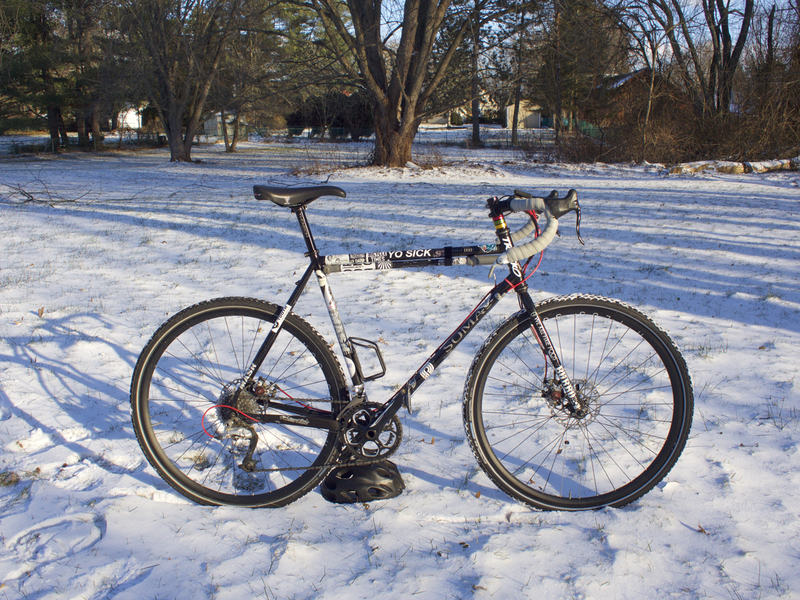 Originally, the Double Cross was my only bike, and I had no Soma Juice or Surly Pugsley. At that stage (early 2015) I wanted the wolverine. One bike to rule them all. But… they were out of stock, and the DC intrigued me, so I thought, what the hell! Well, that turned out to be the right call for me. The Wolverine is a wicked, wicked bike, but the Double Cross makes a better road bike than the Wolvie. It has a racier geometry, it’s a bit lighter, not as long a wheelbase… it’s perfect with a set of slicks. Now that I have a mountain bike, I can get my trail fix and use my Double Cross as an all-road, dirt road, gravel road machine instead of a pseudo-MTB. 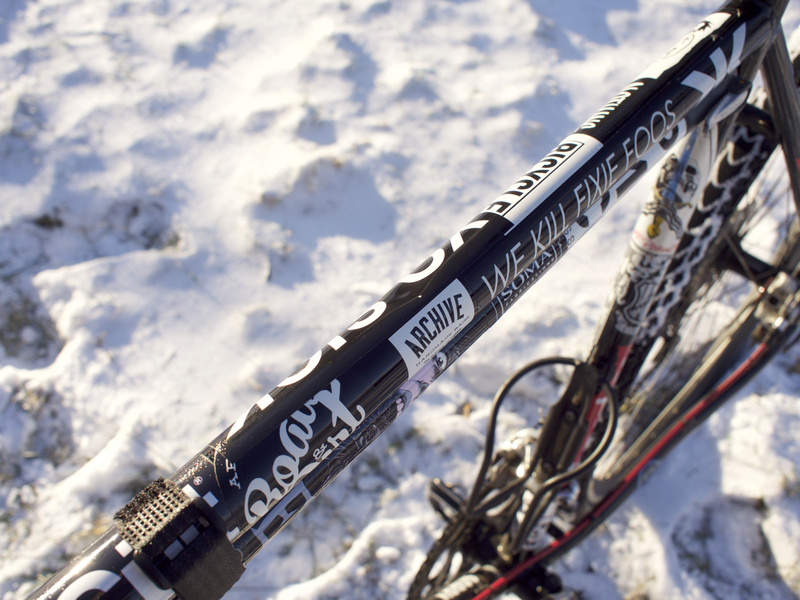 Get the wolverine if you want to tour and mountain bike on it. 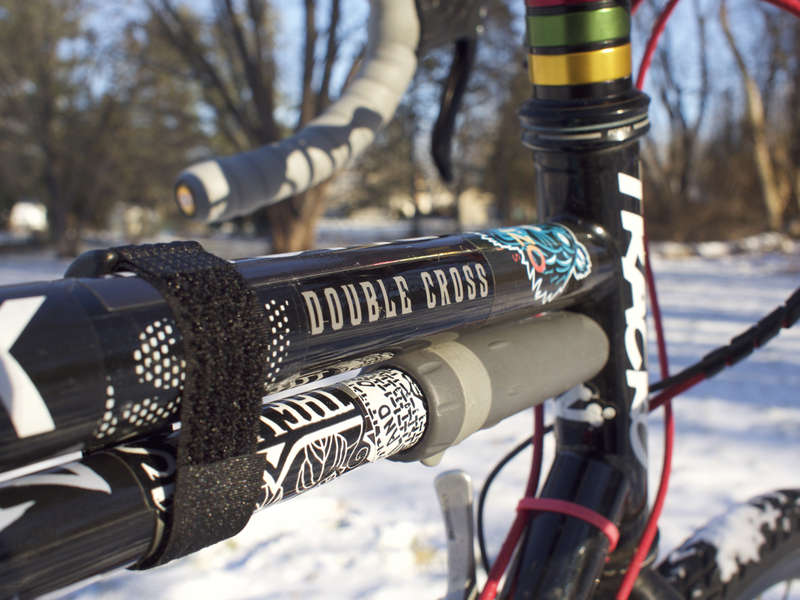 If you’re looking for an everyday pavement bike with occasional adventures, the Double Cross might be the ticket. I think I will lean towards the Wolverine since I already have a very roady bike that I don’t plan on selling. Did you ever have problems running a 10speed cassette drivetrain with friction shifters? I was looking at doing a 10speed, but it wouldn’t index correctly with the Shimano 9speed shifters if i wanted to go that route. The long answer is, when there are too many gears, it becomes hard to “fine tune” your shifter to stay in just one gear. You’ll sometimes find yourself click-click-clicking between two steps on the cassette, or you’ll push down on the pedal really hard and downshift violently by accident. That got annoying. When I switched to a 9-speed cassette, the problem went away. 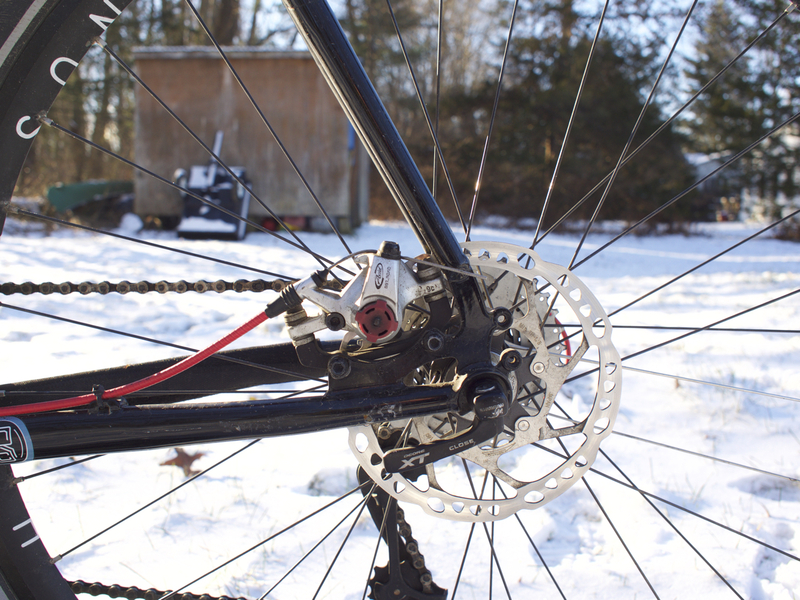 There’s a lot more space between cassette cogs and the chain is bigger and beefier, too. Yes, Richard, I did! It was just a little too close between gears, and I spent too much time fiddling with the fine-tuning of the shifter. 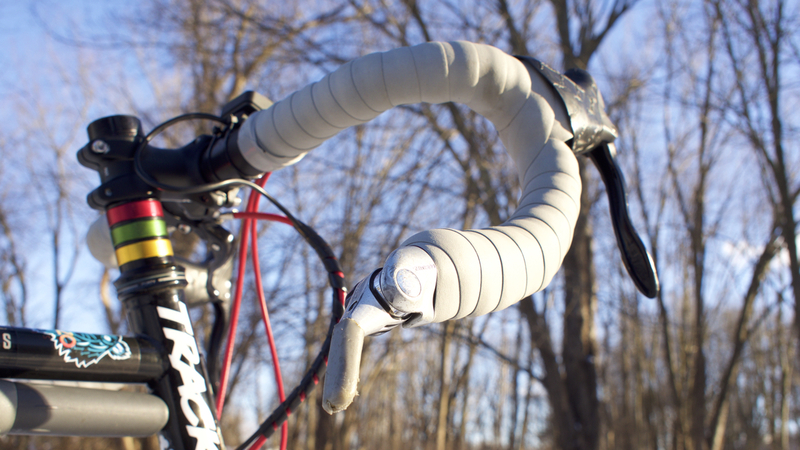 9-speed is surprisingly better for friction shifting. Doug, thanks for the link. Wicked. DTLA commute is no joke, that must be fun! I too have a lovely DC and I’m trying to persuade myself it’s going to be ideal for my touring intentions… I have a question with regard to your comments on stability and front loading – I like a bar bag! 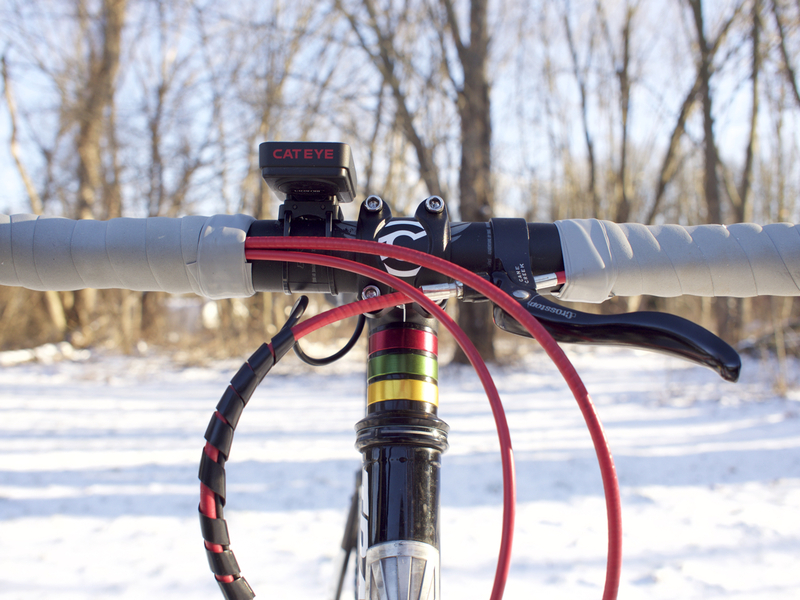 You say you run a long stem sometimes – does this make a difference? From my limited experience, I’d expect the 60mm to be quick steering indeed, perhaps to the detriment of stability? I’m aware of the bb drop compromise, but the chain stays are not so short and I’m using a tubus logo to keep the rear weight low and back (and packing picky!) taken from my old roughstuff tourer the tanking Thorn Sherpa. And what a difference between the two! The DC skips along by comparison. If your weight is low around the front wheel, I don’t think you’ll have any problems. I think stem length is an overblown characteristic of bike handling, or at least, it matters much less than fork rake. I went from a 110mm stem to a 50mm and didn’t notice a huge difference. The only issue I had with the front load was with all the weight way up high in a basket. I’ve decided to get a Wolverine but your build looks pretty sick and I’m trying to get some inspiration as well. Would you be able to put a list of the components you used for this bike? Check the Bicycles tab! You should see a list of components there! “do-it-all.” Only thing is that I live in Appalachian country and the old roads have nasty descents–one in mind is over 27% with a huge crown, lots of road debris to slide on and no guard rail that goes to a big cliff! Add some winter salt to that too and it gets real interesting. So stable descending is a requirement. Liked the set up of the Smoothie ES, but I wanted something with more of grinder set up for those kind of farm roads around here. Would a different fork make a difference on that bike in regard to descending stability? 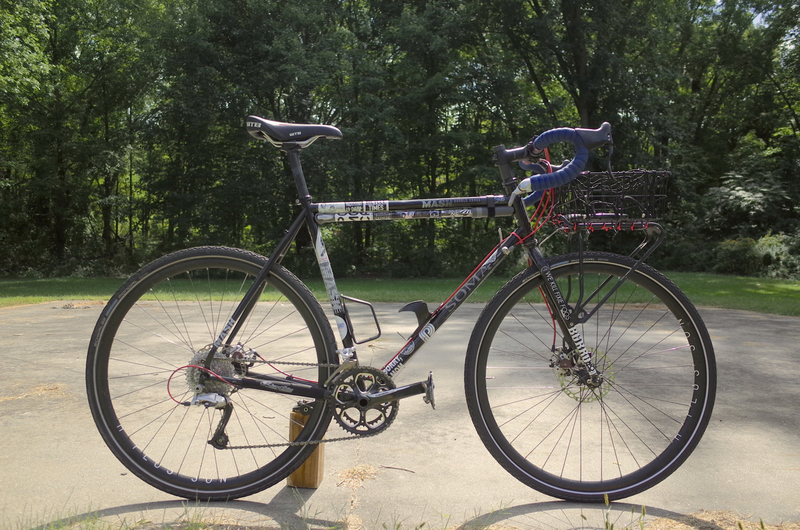 Also, love your review on the Juice–I have a steel SS now, and if I can ever justify it, I’ll get a juice frame. Would like to run a carbon post, and that may be enough of a reason in the end. I appreciate the care that goes into your pubs! Thanks for the note, slohrss29. Great to hear about such an awesome riding location. I love the quieter parts of the northeast, replete with gravel and dirt and good people. Thanks for saying that! I love Appalachian country, some of the best riding in the East! I never felt unstable in the descent if I kept my hands on the bars, but yeah, one of Soma’s other bikes might be just the ticket for your intended use. The Smoothie is a cool frame. The Wolverine has a much more stable touring geometry than the racy Double Cross, and it has plenty of tire clearance for gravel-grinding. 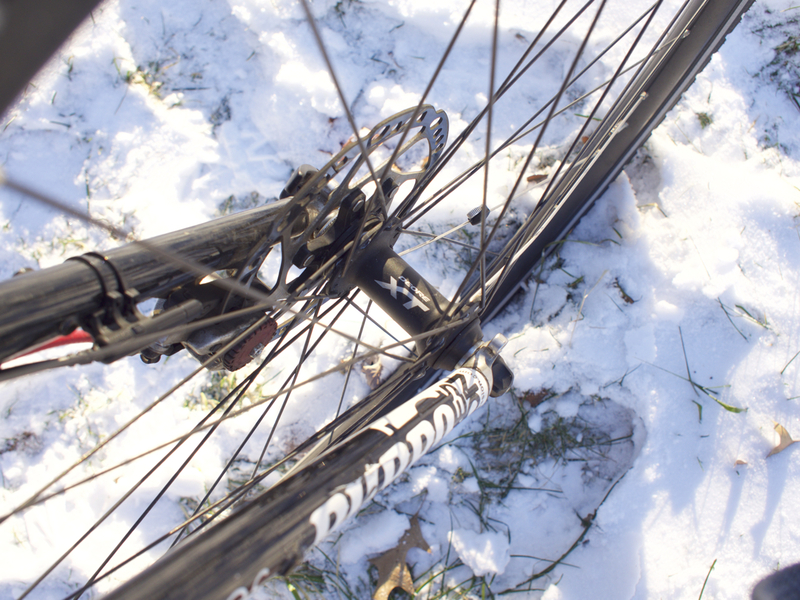 Also, with narrower road tires, your BB height on a Wolverine would be quite low for stable descending. Dude, that is a sweet build. I just put together a New Albion Privateer, which some say runs a close second to the Double Cross in feel and all around ability. I had a few questions. Did you race cross on the bike at all? I’m thinking of getting out there at our local series a couple of times this year. I don’t race cross yet, but I’m definitely thinking about some of the local races! 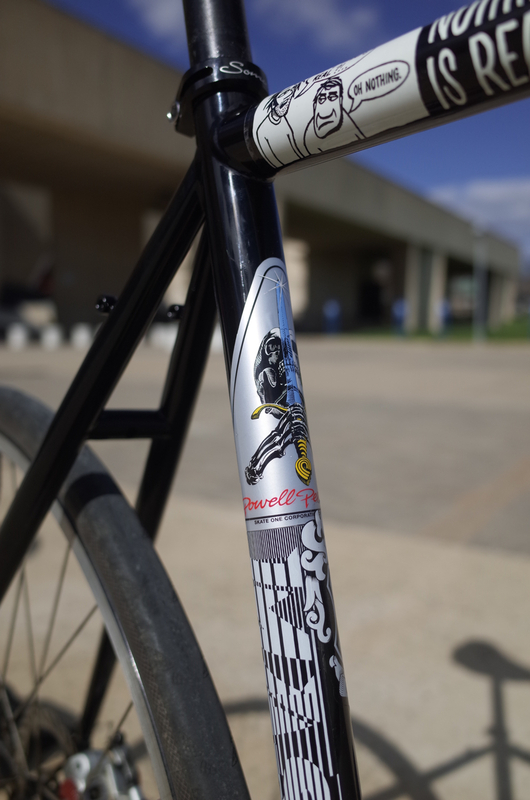 My frame is a 58cm, and the bike handles beautifully with a short stem. I’ve had as short as a 60mm on there, and it was fine, so don’t worry about going to 80 or 90mm. That’s actually the geometry favored by the guy who designed the Specialized AWOL. I’m also curious about size. I’m 6′-0″ and like Threeteas, mostly fit a 56cm with 120 stem. I’d like a frame on the “small side” but of course not too small. My 56cm Felt FC road racer has the same C to C top tube as the 52cm of this bike. I would never imagine I’d fit a 52cm frame. I see you got a 58cm. How tall are you? And what would you recommend for an agressive fit? Thanks and great review BTW! Have you ever ridden Surly’s Cross Check or Straggler? If yes, thoughts? I’ve been looking for Cross Check alternatives, and after reading your review, the Double Check seems to be a good one. 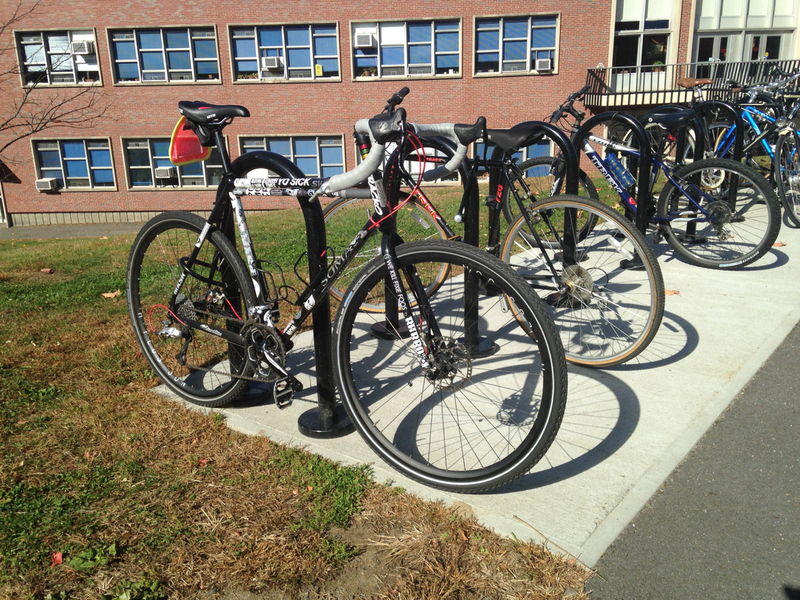 I’ve ridden both of those bikes, and I love both, especially the straggler (I love disc brakes). 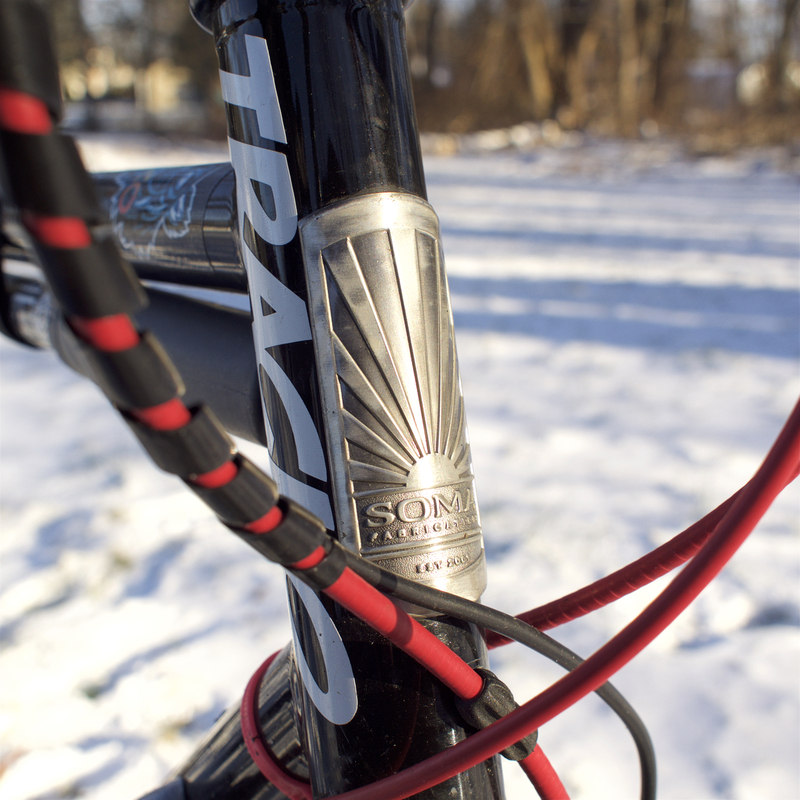 The Double Cross probably has an edge in ride quality thanks to the variable Tange tubing and relatively thin TT, but the Straggler has tire clearance and durability over the Soma. So, pros and cons to each depending on your riding. Hi, thanks for your awesome review of this bike! I’m looking at a used 54cm one right now and was wondering how tall you are- you said the 58cm fits you well. I am planning to get sized at a shop but the Soma I found used is about 2 hours away, so I’m trying to get a good estimate on whether or not it’s worth the drive. I’m about 5’7″ with relatively long legs. I’m also curious about size. I’m 6′-0″ and like Threeteas, mostly fit a 56cm with 120 stem. I’d like a frame on the “small side” but of course not too small. My 56cm Felt FC road racer has the same C to C top tube as the 52cm of this bike. I would never imagine I’d fit a 52cm frame. I see you got a 58cm. How tall are you? And what would you recommend for an agressive fit for me? If you’re 6’0″ and you prefer a smaller bike, don’t go with the 58cm. It was definitely right on the edge of too big for me, but I like bigger bikes. I like feeling like I’m on top of the bike when I’m riding on longer road rides, and I like extra frame bag/bottle space. I would go with the 56cm version of the Double Cross if I were you. That should be a perfect fit. I just did a weekend C&O trail camp trip with mine (4 ortliebs) and it was a little wiggly but it got the job done. I would opt for something else for heavier touring. A year out and I love my New Albion Privateer, which is very similar to the Soma Double Cross and about the same geometry and manufactured by Soma. With that said, although I also like bikes slightly more on the large size than the small size I think I would have picked a 56 cm. instead of a 58 if I had it to do over again. The geometry on a 58 cm is a bit more like that of a traditional 59 cm bike (I prefer a standard 58 cm top tube in general). With such a large selection of stems out there, though, it isn’t hard to find something that fits you pretty well.